Thank you to Steve Fernandes for helping us correct this card. P. C. Sorcar (1913-1971) was the stage name of the Indian magician, Protul Chandra Sorcar. Sorcar was an internationally active magician throughout the 1950s and 1960s, performing his Indrajal show before live audiences and on television. He died of a heart attack at the age of 58 in Japan, on January 6, 1971, where he was performing. His son fulfilled the rest of his contract. See more about P.C. Sorcar on MagicPedia. 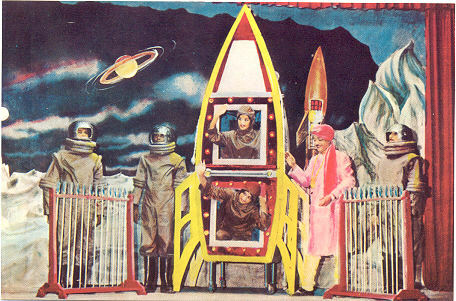 This entry was posted in Corrected, Indian Magician, S and tagged Rocket Ship Illusion, Sorcar. Bookmark the permalink.